Modular Clean Room Systems - Chyi Lee Co., Ltd.
Chyi Lee offers a complete line of innovation walls system, door, windows and hardware designed to meet satisfy your needs. In order to get close to your complete satisfaction, our trained staff and sales are appreciate to hear any recommendation about our modular cleanroom, clean rooms system or other products. With the deeply communication, we can realize your requirement for designing a customized clean room equipments. ■ Equipped with lighting, receptacle, LAN cable and temperature/humidity control system, which can be connected to central control,system for remote monitor/control. 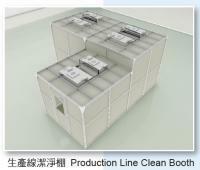 The operation of cleanroom is immediately available upon completion of unit and hook up of utilities. ■ Engineering integration for easy and flexible application. ■ Consisting of climate unit, ceiling grid, tool partition, FFU, lighting and PAH, which are TOPWELL developed products for assurance of quality and cost control. ■ Energy saving design is considered in cooling water, re-circulated air and compressor heat recovery to assure the most efficient running cost. ■ Equipped with gowning room, air shower and machine room,providing the cleanroom with protocol function.